Dan Berard is a lifelong birder for whom birds were a gateway into a fascination with natural history. He has led birding and natural history tours across North America, Hawaii, Trinidad and Tobago, Mexico, Panama and pelagics on both coasts. 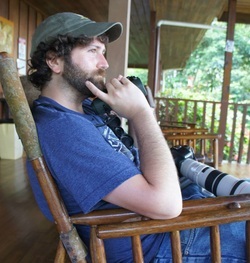 While in Panama, he worked at the Canopy Tower Ecolodge counting raptors for the Panama Audubon Society’s Raptors Oceans to Oceans hawk watch and was a consultant for the Emmy Award winning documentary Earth Flight. He is excited to be involved with the Ocean State Bird Club and learn more about all of Rhode Island's varied ecosystems. Dan is also a founding member of the Ocean State Bird Club. 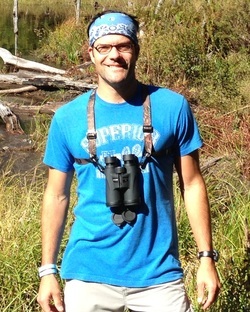 Vice President Matt Schenck is an avid naturalist and professional environmental educator. He has spent 4 years connecting people to the outdoors in Colorado, Pennsylvania, Tennessee, and Georgia before moving to Rhode Island in 2014. Matt is the Summer Camp Director at Norman Bird Sanctuary in Middletown and along with birding enjoys wildflowers, butterflies, dragonflies, and just being outside and exploring. Michael Gow is a veteran teacher of 18 years. Throughout his career, he has organized and led many nature events and walks for elementary and middle school aged kids. Having spent much of his free time hiking, canoeing, fly fishing, birding, and camping, Michael now enjoys sharing his love of the outdoors with his students as well as his own two children. Michael is an avid long distance hiker having hiked the Long Trail in Vermont and the Superior Hiking Trail in Minnesota. Michael is also a founding member of the Ocean State Bird Club. ​Susan Schenck is a naturalist and environmental educator. She has taught as an environmental educator for the past 5 years, and completed a graduate program in Environmental Education from the University of Minnesota in 2014. She currently works for Audubon Society of RI as an environmental teacher. Jana Hesser, a mother and grandmother, has been a RI resident since 1988. She retired in 2009 after a long career including as a Professor of Medical Anthropology, as a Director of Market Research, and most recently as a Public Health Administrator for health statistics. A lifelong enthusiast of outdoor activities, and an avid reader of natural history, she discovered the pleasures of birding in 2003. A journey of discovery, birding has also brought her into a wonderful circle of “birding buddies”. Jana ​is also a founding member of the Ocean State Bird Club. Suzanne French is the Manager of the Wild Birds Unlimited Nature Shop in Warwick, RI. As the bird and optics specialist, she advises anyone interested in birds from beginning to seasoned bird enthusiasts. She has designed, patented and sells a line of book covers specifically for field guides with her own online company named Fieldfare. The field guide covers have been sold to nature lovers as far away as England, the Netherlands, and Costa Rica. Suzanne is also a founding member of the Ocean State Bird Club. ﻿Candy Powell, a retired maternal child health nurse, has enjoyed birding as a hobby for more than 40 years. She is the immediate past president of the Board of Directors for the Audubon Society of Rhode Island, but continues to serve as Board member of that organization. Candy was the founder of, and still organizes, the Conanicut Island Christmas and Spring Bird Counts in Jamestown for more than 30 years. Along with her husband, Chris, she enjoys birding not only in RI but throughout the US and other countries.﻿ Candy is also a founding member of the Ocean State Bird Club. Hugh Markey is a freelance writer, naturalist, and teacher who learned about birds when his dad took him trout fishing as a boy. Since 2011, Hugh has devoted much of his time to writing about the outdoors. He has been lucky enough to go into the field with scientists and write about birds, bees, bats, and a whole host of other denizens of the natural world. Find his stories and pictures on his blog, “Science and Nature for a Pie” at http://scienceandnatureforapie.com , and follow him at www.facebook.com/scienceandnatureforapie . Although an avid birder for more than 25 years, I was not drawn to the outdoors and joy of birding until midlife. I discovered the serenity of birding to balance the stress of a career as a mental health professional. After retirement, I enhanced my birding skills as a volunteer for the Massachusetts Breeding Bird Atlas (2007 -2011), completing six blocks. It was a joy to discover great birding spots in my own backyard! Recently, I volunteered for two blocks for the RI Breeding Bird Atlas. I offer weekly birding walks in the Southeastern MA Bioreserve. I also participate in several bird clubs in MA and, of course, the OSBC.